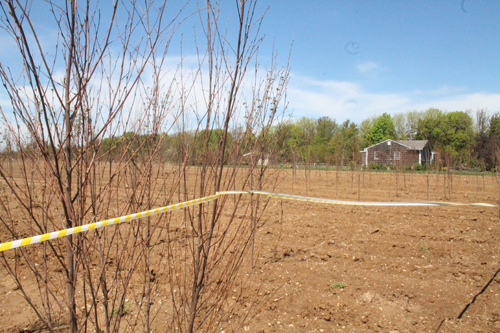 PAUL SQUIRE PHOTO | Caution tape now surrounds the Jamesport fields where the saplings were allegedly stolen. A Jamesport nursery owner reported that someone took about 30 trees from his field on Herricks Lane, Riverhead police said. Lou Caracciolo of Shade Trees Nursery’s told the News-Review he noticed some trees were missing from a parcel about a half-mile from the nursery’s main office Wednesday. On Thursday, he realized more trees were missing. The trees were “an assortment of shady flowering trees,” he said. Police said maple, cherry, pear, red bud, birch and zelcova trees were removed from the field. Mr. Caracciolo said whomever took the trees likely parked along the road and pulled out the trees by hand, adding that the nursery has been the victim of larcenies in the past. The trees are worth about $1,500 total, police said. Detectives are investigating the reported theft.